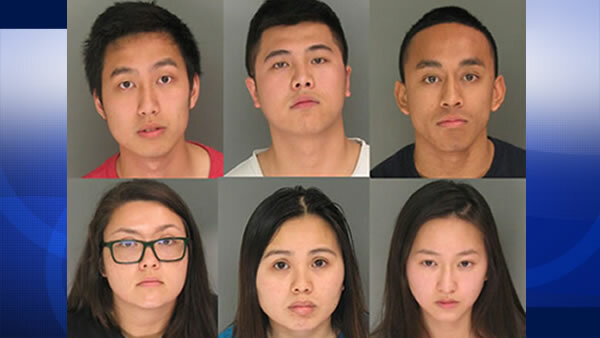 The UC Santa Cruz alleged drug ring suspects were identified as Mariah Dremel, Benny Liu, Cesar Casil, Nathan Tieu, Hoai Nguyen, and Cecilia Le, all 21 years old. SANTA CRUZ, Calif. -- Six University of California at Santa Cruz students were arrested Friday on suspicion of running a drug ring that uncovered more than $100,000 worth of MDMA, police said Tuesday. The students were affiliated with one of two affiliated campus Greek organizations, Lambda Phi Epsilon and Alpha Kappa Delta Phi, according to police. The suspects were identified as Mariah Dremel, Benny Liu, Cesar Casil, Nathan Tieu, Hoai Nguyen, and Cecilia Le, all 21 years old, who allegedly possessed a controlled substance, police said. About 5,000 tablets of MDMA that weighed about 4.1 pounds were found and have a street value of more than $100,000, police said. Police worked on the case with help from personnel at the Department of Homeland Security and U.S. Postal Inspection Service. The homes were in the 400 block of Locust Street, 200 block of Castillion Terrace and the 100 block of Peach Terrace, according to police. The warrants were served with help from the Santa Cruz County Anti-Crime Team, Drug Enforcement Administration, U.S. Postal Service and Homeland Security, according to police. Officers learned on Friday that Homeland Security investigators were able to stop a second shipment from arriving to the group, police said. MDMA, more commonly known as Ecstasy or Molly, is a psychoactive drug that can increase a person's heart rate and blood pressure, DEA officials said. People can experience increased energy from the drug in addition to sadness, anxiety and depression, according to DEA officials. If taken in large doses, MDMA can lead to serious health complications or death, DEA officials said. Lambda Phi Epsilon is described as an international Asian-American-interest fraternity that sets high standards for academics, social experience and community service, according to the college's website. The International Fraternity has placed the University of California, Santa Cruz chapter of Lambda Phi Epsilon on suspension. The leadership of Lambda Phi Epsilon International Fraternity, Inc. is aware of the situation involving its undergraduate members at the University of California, Santa Cruz and will be cooperating with the local authorities to understand what happened. The International Fraternity has placed the University of California, Santa Cruz chapter on a Cease and Desist, suspending all normal activity and chapter functions pending further investigation. Lambda Phi Epsilon has the following zero tolerance policy for drugs and other controlled substances, "The possession, sale or use of any illegal drugs or controlled substances while on chapter premises or during a fraternity event, or at any event associated with the fraternity, is strictly prohibited." Furthermore, this incident does not reflect the values the International Fraternity espouses for its members. The mission of Lambda Phi Epsilon is to guide men on a lifelong discovery of authenticity and personal growth and the International Fraternity is committed to helping its members live positive, healthy, and responsible lives. Alpha Kappa Delta Phi sorority's Delta Chapter was created 24 years ago and aimed at advancing sisterhood, philanthropy, scholastic excellence and Asian-awareness in the community, according to the group's website.